Corporations, schools, fraternities, restaurants, and airlines around the world have already chosen The Tie Bar for their custom neckties and scarves. And we'd love to work with you too! 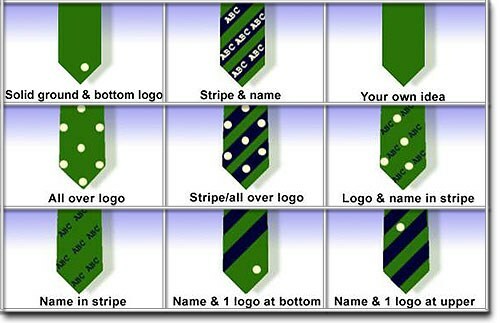 You can get custom made ties, bow ties and scarves using your logo, design and/or organization colors. Our custom projects are made of 100% silk and you can choose your sizing. Everything is designed from scratch, so there are no limitations to colors or designs! Custom scarves are a minimum order of 50. Pricing is $25 each for one sided printing and $40 for double sided printing. There is a one-time design fee of $50 to get started. Throw in a nominal shipping amount, and that is everything! We have no hidden fees or charges. 1. Send in your logo using the submission form below, along with your color choices and details about your design idea. 3. After payment of the design fee, we will email a digital layout of your proposed design. We will design up to 2 designs as part of your fee. 4. Once you approve your digital design, we will create a fabric swatch for your review. 5. Approve your swatch and you are ready to order! If you have any questions, email us at info@thetiebar.com or call us toll free at 877-888-TIES. Send us your information and logo right here from our website by filling out the form below. A representative from The Tie Bar will contact you regarding your submission.